The Uzbeks are a mixture of Turkic tribes that have many Mongolian and Iranian traits. The term Uzbek, meaning "master of himself," accurately describes the people. Their love of freedom and sense of restlessness have often caused conflicts with the conquerors who have invaded their homeland, the west central Asian region known as Turkestan, throughout the centuries. Conflicts in Turkestan began with the invasion of Alexander the Great in the fourth century, followed by the Arabs and Turks in the seventh and eighth centuries, and the Mongols, under Genghis Khan, in the thirteenth century. Tamerlane's conquest in the 1300s brought the last, and perhaps finest, period of culture and learning to the Uzbeks. Turkestan entered a long period of decline in the 1500s. By the time the Russians invaded the area between 1860 and the mid-1880s, Turkestan had broken into several warring principalities. It was then that many Uzbeks dispersed throughout Central Asia. Traditionally, the Uzbeks were farmers and nomadic shepherds. Today, most of the Uzbeks living in Kazakstan inhabit the rural Chimkent region. Others have migrated to urban areas. The shepherds generally live close to their flocks of sheep and herds of horses, cattle, camels, and goats. The city dwellers are mostly merchants and craftsmen. Many are skillful bazaar artisans (silver and goldsmiths, leather workers, woodcarvers, and rug makers). Uzbek women do much of the household work and handle many of the less skilled and manual jobs. They are often segregated from the men. Most Uzbeks, especially those in urban areas, have adopted European style clothing; some, however, still wear traditional dress. Although most of the Central Asian countries accepted Russian authority reluctantly, they became some of the most progressive of the soviet republics. During the 1930s, many peasant farmers were organized into large collective state farms. With the introduction of modern mechanized farming equipment, the farms soon became intensively cultivated. During World War II, some of these republics became the main arsenals for the Soviet war effort because it supplied the front with much needed food and equipment. The traditional social unit, which was based on kinship ties, is continuing to slowly break apart. Crowded modern housing, especially in urban areas, prevents generations from living together and discourages large families. These factors, along with increased educational opportunities, mean more Uzbeks are finding work away from their home areas. During the decades under Soviet rule, Uzbeks faced intense pressure to "become Russian." Despite the forced collective farming and anti-religious campaigns, large numbers of Uzbeks retain many elements of the classic Central Asian culture. 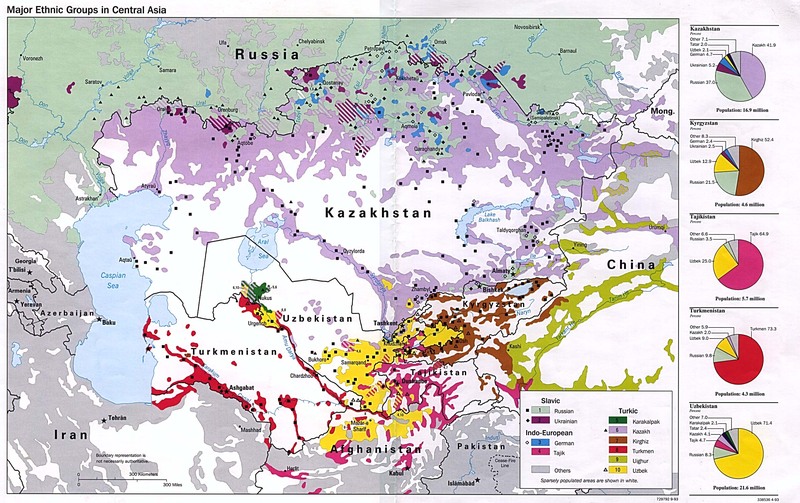 Uzbeki is a vital language for all of the former soviet Central Asia. It is the language that is most understood and spoken by the greatest number of people. Uzbeki was transcribed into Arabic script in 1923, into Latin script in 1927, and replaced by Cyrillic in 1940. The majority of the Uzbeks are Sunni Muslims. The role of the numerous holy places of pilgrimage in Kazakstan is less significant than in other territories of Central Asia where the tribal structures are still strong. Pre-Islamic shamanism (belief that there is an unseen world of many gods, demons, and ancestral sprits) survives in an Islamic form. Today the shaman (priest or medicine man) is a practicing Muslim who combines shamanistic trances with reciting Islamic prayers, fasts, and other Islamic practices. Ministry among Muslims is a difficult task. Kazakstan desperately needs prayer and more Christian workers. * Scripture Prayers for the Uzbek, Northern in Kazakhstan. * Ask the Holy Spirit to soften the hearts of Uzbek Muslims towards Christians. * Ask God to grant wisdom and favor to missions agencies that are focusing on the Uzbeks. * Pray for effectiveness of the Jesus film and Christian native broadcasts. * Ask the Lord to call additional people who are willing to share the Gospel in Kazakstan. * Ask the Lord to raise up missionaries who can effectively minister the Gospel to the Muslims and other Uzbeks. * Pray for God to raise up strong local churches among the Uzbeks.